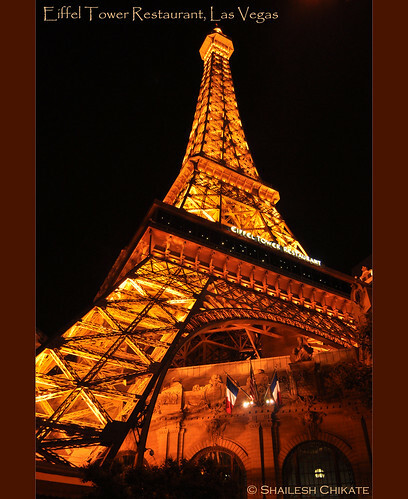 Congrats to Shailesh Chikate who got lucky with this travel shot of the Eiffel Tower Restaurant in Las Vegas with his Nikon D5000 in Program AE mode using all the “wrong” settings, but proving that nice composition, editing, and a bit of luck can get still get you a nice shot. I like the lighting of the shot and it’s clear by the settings this was most likely a hand-held shot, so congrats for pulling this one off. This reminds me of something I did when I was learning how to get better at shooting manual where I’d take the first shot in Program AE and then use those the settings as a starting point as to what my manual exposure should be, and then I’d adjust them based on my artistic intent. For a shot like this I would have tried to find some stabilization so I could keep my ISO lower than 500 and my f-stop up to f/11 or f/13 if I could pull it off. This would mean a long exposure that would be impossible to hand hold, so without a tripod or a nicely placed object that I could use for stabilization it would have been really hard to pull off this shot. This goes back to the general philosophy that the best camera or settings are the ones that actually get the shot, and here Chikate did that so it’s pretty hard to argue with the results. Congratulations Chikate for accomplishing the most important goal! earn more about how you can participate in the Photo of the Week contest by clicking here. Fanatics Bro…..great click. Super-duper liked . Much Thanks Ron. Liked the honest comment on the Photo. This will really help me to improve technicalities in photography.